The client’s situation: Dr. Allison Rees is a Parent Educator who runs her business from home. The computer she uses was running slowly, files were scattered and getting lost, she needed anti-virus protection, and a system for backing up her files. 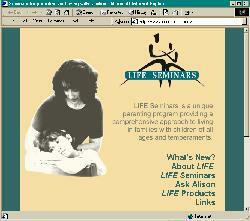 The website for LIFE Seminars, which is the Parent Education company run by Allison’s partner Dr. Alison Miller also needed revamping and updating. MoreThanSolution: We were able to address all of the items on Allison’s home computer – in less than two hours. We removed some programs that started up automatically, using system resources, but that Allison never used. We showed Allison how to clean up and organize her files. We added anti-virus protection and set it up to update itself automatically. And finally, we set up a simple backup system consisting of installing a small spare hard drive and writing an automated task to back up everything of importance: Allison’s documents, emails, contacts, and internet favourites. Since it is physically on a separate hard drive, Allison is protected from not only accidental deletion or over-writing of files, but also from hard drive failure. The LIFE Seminars website is actually the reason MoreThanSolutions was started. LIFE Seminars had a hard time finding a computer consulting company they could trust and that could offer a wide package of services. When we found that out, we decided we should make one. Client says: “I feel so relieved to know that my work is secured. Even though I spend hours everyday on my computer there is so much that I don’t understand about it. If my computer had crashed before, I would have lost everything so it felt like I was walking on a tightrope. The reorganization of my programs and files has saved me a ton of time. Such a tiny investment for such an important part of my working life!”, Allison Rees.